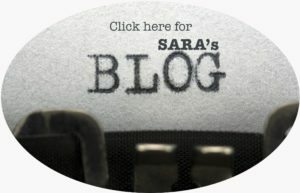 Sara Gross looks at how one visionary Frenchwoman could have saved us from a 100 years of inequality. One of the major blights on modern Olympic history is the fact that the Games were founded to promote aristocratic values and masculine ideals. That is to say, the Games were by definition, both classist and sexist. The vision of Frenchman and second International Olympic Committee (IOC) President Baron Pierre de Coubertin and his entourage included systematic discrimination against women and was designed to cement the class structure in England, Canada, and the United States. While he is repeatedly quoted using language of philanthropy and inclusion, the games provided opportunities only for middle and upper-class men. Coubertin was convinced that women, like the other “weak” members of society such as children and the elderly, were not made for physical activity. Sport was too “violent” for them based on biological differences. Further, he feared that women’s athletic “exhibitions” would erode society’s morals by arousing the passions of male spectators. For these reasons, the 1896 Olympics Games was not open to women. One might be tempted to forgive Coubertin and his cohorts for their contemptible attitude towards female athletes and women in general since, after all, they were products of their time… right? Didn’t everyone think that way back then? From the outset multiple leaders, both male and female, challenged Coubertin’s views and, starting in 1900, women’s events began to be included in the Olympic program. Women’s sports were limited to those considered proper for white, middle and upper-class women; golf, tennis, archery, swimming, figure skating and fencing were all on the program by 1924. 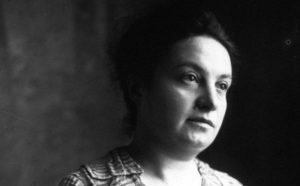 One activist and visionary from this era stands out – Alice Milliat. 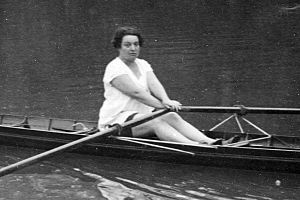 Born in 1884 in Nantes, France, Milliat studied to become a teacher and was an active sportswoman with a love of rowing. In 1922, she became the President of the Federation Sportive Feminine International (FSFI). Milliat believed that sport developed personalities and gave young women confidence. Her own confidence and leadership led to a 15-year international campaign for the development of women’s sport. It was a time of cultural upheaval between two world wars when the feminist movement was making a splash. In this milieu, Milliat and her contemporaries created an international federation which gave birth to the first “Women’s Games” in 1921.The Games were held in Monaco and women from France, England, Italy, Norway and Sweden competed. In 1922, 38 countries from 5 continents were affiliated with FSFI and the decision was made to hold the “Women’s Olympic Games” quadrennially. The FSFI aimed to take the men’s Olympic model, adapt and improve it for women. Milliat’s vision was more-or-less one of full inclusion of women in the Olympic movement from participation to leadership. Between 1922 and 1934 the FSFI organized four Women’s Olympics showcasing hundreds of athletes to thousands of spectators. In the Paris Games in 1924, 15,000 people came to watch. One Paris newspaper even compared Milliat’s success to Coubertin’s. Milliat and her peers did more to promote women’s sport than either the IOC or the International Association of Athletics Federations (IAAF) in the 1920’s and 1930’s. As the FSFI gained power and influence, the IOC’s Olympic Games continued to offer only a handful of events for women. The IOC exchanged eleven letters with Milliat between November 1926 and April 1927. The FSFI president wanted full participation of women in Olympic Track and Field events, and total recognition of the FSFI, on the same level as the men’s federations. Further, she demanded that FSFI members serve on the National Olympic Committees (NOCs). Milliat’s vision was more-or-less one of full inclusion of women in the Olympic movement from participation to leadership. It was her opinion that women’s participation in the games only made sense if it was total. The IOC’s fourth president, Henri de Baillet-Latour was no more open minded about women’s sport than Coubertin had been and refused to recognize more than one federation per sport – i.e. the men’s federations. This eventually strangled out any power the FSFI had gained during the 1920’s and the men’s federations maintained control and power. Many people did not agree with Milliat’s “all or nothing” approach to women’s inclusion in the Games, and one by one the men’s federations swallowed up the women’s. In 1926, the IOC compelled the FSFI to stop using the word “Olympic” for their games. The final death knell was sounded when the French government reduced their funding starting in 1928, and removing all funding by 1936. Alice Milliat’s activism was directly responsible for the development of women’s basketball, football and athletics in France as well the international institutionalization of women’s sport. Some historians have noted the increase in women’s participation in the Games in Amsterdam in 1928, a reflection of Milliat’s work. It is striking that almost 100 years ago a young visionary called Alice Milliat saw the writing on the wall for women’s sport. Notably, it took the IOC over seventy years to begin to share the vision of the feisty Frenchwoman. In 1995, the first ‘women and sport’ working group was created among IOC members. In 2012, women made up 44% of participants and 46% of events included women. While it is predicted that Rio will be the first Olympic Games to have gender parity in participation numbers, we still have a long way to go in terms of sport leadership. It is striking that almost 100 years ago a young visionary called Alice Milliat saw the writing on the wall for women’s sport. Did she know it would take 100 years to begin to see her vision come to life? And above all, who is the Alice Milliat of our times and are we listening? Wamsley, Kevin B. “The global sport monopoly: a synopsis of 20th century Olympic politics” International Journal 57.3 (Summer 2002): 395-410.